Everyone knows that butches love boots. It's one of those iconic accouterments that make us feel kickass. So today, I'm giving you a quick guide to casual boots (e.g., boots that can be worn with jeans, khakis, Kuhls... basically anything besides dress pants). It's been a long time since work boots were just used for work. Work boots look great with jeans, and can even be worn to most non-physical-labor workplaces on casual days. Many come with steel toes, which are super cool, but not really necessary (and actually pretty heavy) unless you work in construction or in a machine shop or something. I especially like Frye Dakotas (pictured), but there are tons of great work boot options from many other brands, including Caterpillar, Thorogood (often made in the USA), and Wolverine. I'm going to lump Australian work boots in with Chelseas, since they look so similar. The basic point is that they fit like a glove and are easy to pull on and off because of the elastic sides. For the quality, it's hard to beat these Blundstones (pictured)--but if you want something dressier, get a pair that looks more like these (the big differences are the polish/shininess and what the sole looks like viewed from the side). Fun fact: according to Wikipedia (which is never wrong), the Stormtroopers' boots in Star Wars were plain ol' black Chelsea boots, painted white. I used to hate chukkas, but I have to admit that they've grown on me. They're stylish, come in great colors, and work in all seasons. Chukkas are ankle-height (the equivalent of mid-tops in tennis shoe terms) and usually have just 2-3 eyelets. I like this To Boot New York pair (pictured, also comes in a dark chocolate brown), and Timberland and Johnston & Murphy make nice ones, too, including these and these. I don't usually think of engineers and motorcyclists as heavily overlapping categories, but boot names are the exception. Made of heavy leather, these are usually taller than average boots and have a strap at the ankle and/or the calf for adjusting the fit. Unsurprisingly, Harley-Davidson has some cool styles. brown or black rubber ones. There are bunches of great-looking ones to suit every butch's personality, including these "Culture Boots" (eh?) by BED:STU (the blue ones, pictured above), and these Wolverine 1883 Mayall DGs (pictured right). It probably goes without saying that all of the boots I've written about here, as well as most of the ones in The Butch Store, are "men's," so it may be harder for you to find the right fit; if you're like most women, your feet are smaller and/or narrower than the average man's. But with patience, you'll find brands that work for you. (And here's a hint: using these insoles will increase your shoe size by a half to a full size!). Hope you enjoy the new Butch Store additions. You didnt mention my favorite brand and that would be Doc Martins. They fit really well and Dykes need to remember to use Boot Socks especially when wearing mens boots. I'm a Doc girl, too. I love boots but here's my advice for the economically challenged butch: Walmart has great work boots and they usually carry smaller sizes. My other favorite is Leatherup.com. They carry lots of sizes! As us Aussie butches know - your wardrobe isn't complete without a pair of RM Williams boots. 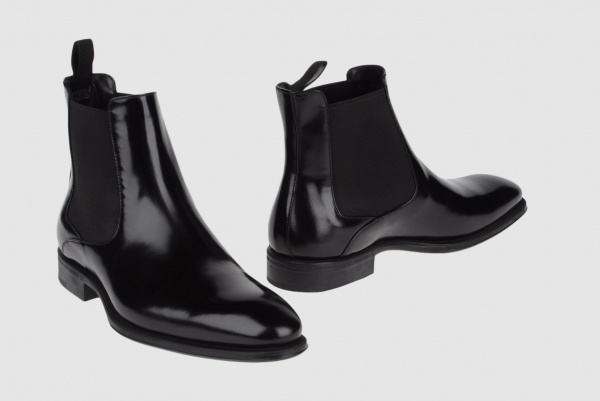 They are dress boots that look GREAT with dress pants, go well at the pub or in the board-room, nice and shiny and easy to kick off when 'necessary'!!! Ah Blundstones, they are amazing, the chisel toe style is a little dressier. They are my boots, for everyday the original in Stout Brown and for my dressier (which for me means black jeans:-) the crazy horse brown chisel toe, although, lately, I've been lusting after the American made Frye harness in cognac...yummy:-) Don't wear black boots, never have it's a personal style thing. So, I've got my Docs for every day wear, for hiking it's Tims all the way! The wife and I each sport a pair of those. I have a nice pair of dressy type Bass browns for evey occasion that requires a brown belt. I would love a pair of Harley Davidson black bike boots, but at this point in my life, I don't have a place to just wear them. They are hard to dance in, I can't teach PE in them, and I don't even own a bike (in Fantasyland I do). I just admire them longinly in the stores. So glad you posted the Frye Dakotas. I had been looking high and low for a pair like these for at least two years, even scouting out work-supply stores to no avail. I just got my Dakotas and am wearing them for the first time right now. Luuuuurv!